A Database Developer develops tests, improves and maintains existing and new databases as a way to help users in their data retrieval process. The most powerful responsibilities that are normally highlighted in the Database Developer Resume are designing reliable databases, optimizing and maintaining legacy systems, solving database errors and malfunctions, liaising with developers to enhance applications efficiency, modifying or editing databases, conducting tests, providing data management support to users, ensuring that the overall database programs of company meets the performance needs and suggesting new database products or service. 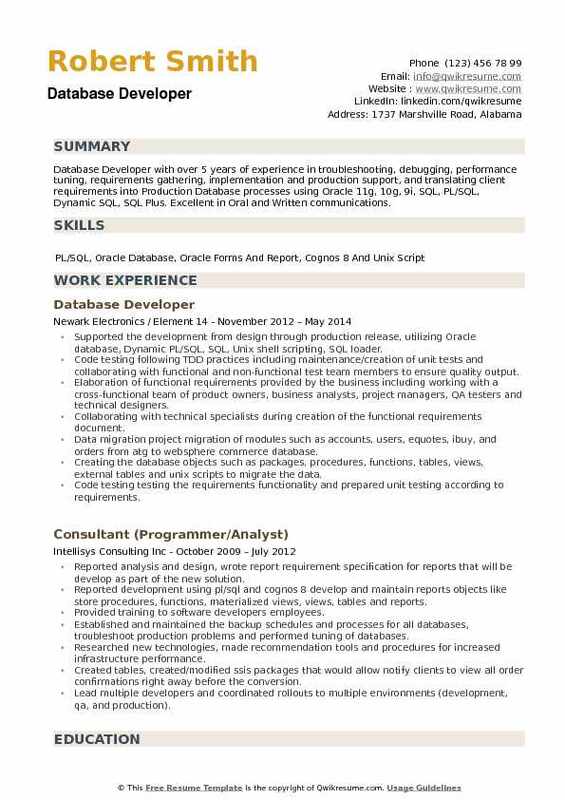 Summary : Database Developer with 9 years of experience in the Retail domain. Worked extensively on client-server and enterprise application development using Oracle SQL, PL/SQL. Experience in project planning, system design, functional and design specification, impact analysis, coding, testing, implementation, support, and maintenance. Experience in working closely with a business team and Brainstorm for solution by doing System Analysis and also documentation of all the impacted components. Established the global asset protection teams to promote the safe use of its platforms and to collaborate with local, national and international law enforcement in apprehending and prosecuting criminals. Involving in the development, maintenance, and enhancement of the PIX application. Working closely with the business analysts and business users to understand the business requirements. Involving in the PL/SQL code review and modification for the development of new requirements. Developing custom stored procedures and packages to support new enhancement needs. Using the business object reports to generate reports using ref cursors that were passed from PL/SQL procedures. Involving in production operation team for managing code merge. Handing production support tickets. Writing shell scripts that assisted in the migration of data and creation of custom views which served as primary tools for analysis. Also writing scripts to enable database purge of related queries/functions/procedures which were found to be either old or causing performance issues. Using SQL loader to upload bulk data by writing scripts for the control file in order to migrate the data from legacy system CSV files to production. 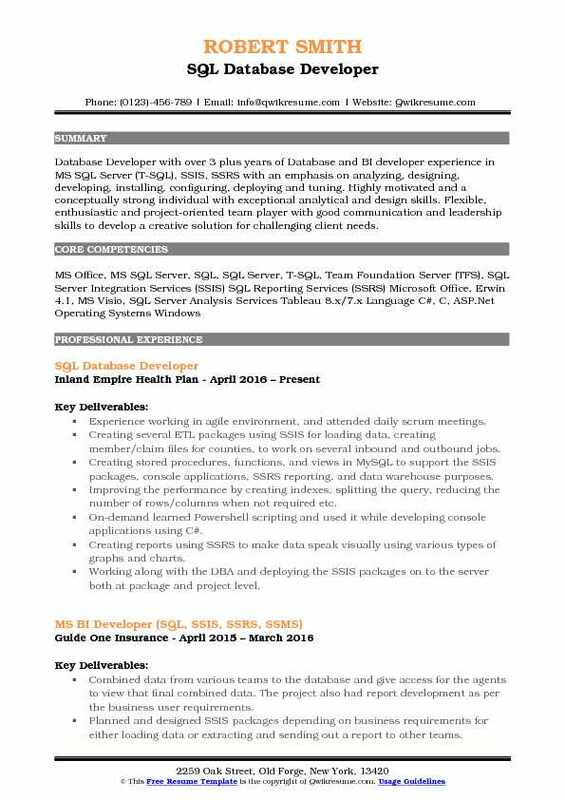 Objective : Highly accomplished and solution-driven Database Developer with 3 plus years of combined experience in the Sales and Finance domain. Experience in database architecture, data warehousing, reporting analytics and ETL development. Proficient in delivering end to end solutions across different data platforms. Strong experience in Data Mapping / Extraction / Transformation and Load using MS Business Analytics Stack and Cloud Analytics. Responsible for providing solutions to all data related needs to support existing and new applications. 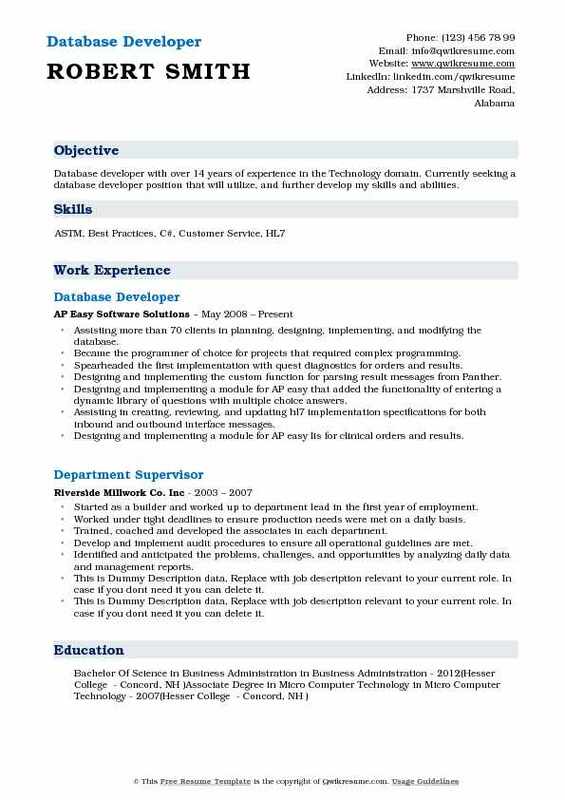 Acted as the single resource to design, develop and deliver database solutions to support in-house built applicant tracking system "opportunityteam.org" and office management system “office manager”. Took the lead role in designing databases to house all "OTO" data in all 5 different environments (Prod, Staging, QA, Dev, and Support). Involved in every step from the beginning stages of the projects with requirement gathering to implementation and maintenance. Designed and created table structures for applicant OB/IB messages (email/voice/text), resumes/notes/ratings, applicant sharing and blocking, archiving, office hierarchy and office personnel hierarchy and history, campaign distribution. Developed and maintained numerous complex near real-time ETLS to extract the data from multiple source systems like Oracle, SQL server, and flat files and loaded into SQL 2014 using SSIS. Developed ETLS to push data into Salesforce objects from OTO servers using Informatica Cloud. Designed and developed numerous complex queries, views, functions and stored procedures to work seamlessly with Appdev teams data needs. Optimized performances of many stored procedures, T-SQL queries to deliver big amounts of data under two seconds. Successfully optimized "security" control etl (used for application security) by a big margin (from 20+ mins to 11 secs) by applying performance tuning techniques like query tuning and parallel processing. Extensively used SolarWinds (database monitoring tool) to monitor servers for deadlocks, long running queries, stored procedures and performed performance tuning as necessary. Worked with multiple teams to design, develop and deliver early warning system. Objective : Junior Database Developer with around 3 plus years of IT experience in Microsoft Business Intelligence technologies like SQL Server Integration Services (SSIS), SQL Server Reporting Services (SSRS) and SQL Server Analysis Services (SSAS). Extensive knowledge and Experience in dealing with Relational Database Management Systems including Normalization, Stored Procedures, Constraints, Querying, Joins, Keys, Indexes, Data Import/Export, Triggers, and Cursors. Creating SSIS packages for data importing, cleansing, and parsing etc. Extracted, cleaned and validated. Creating complex queries to automate data profiling process needed to define the structure of the pre-staging and staging area. Scheduling the cube processing from staging database tables using SQL server agent. Generating reports using SQL server reporting services2005/2008 from OLTP and OLAP data sources. Designing and deploying reports with drill down, drill through and drop down menu option and parameterized and linked reports. Preparing the layouts by placing the fields in the appropriate place according to the requirement of the final report. Creating standard report subscriptions and data driven report subscriptions. Creating report snapshots and cache for better performance. Creating several materialized views and UDFS to be accessed by the new front end applications. 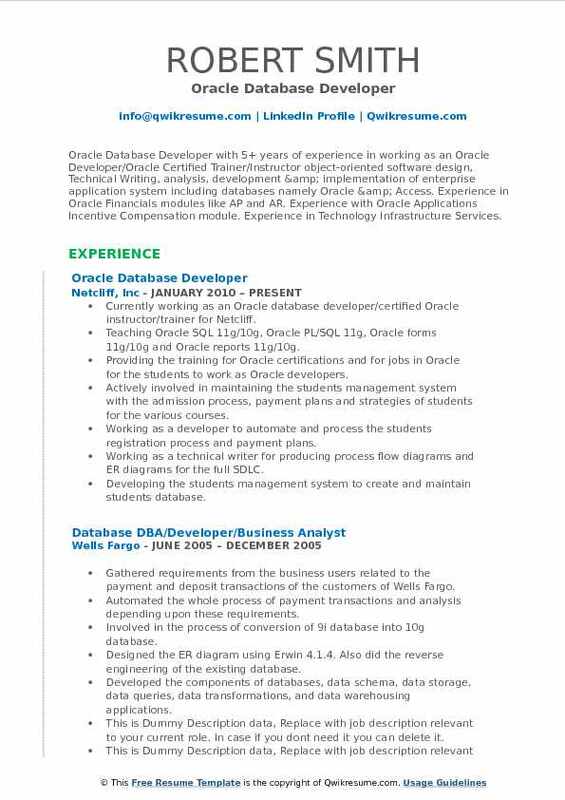 Headline : Oracle Database Developer with 5+ years of experience in working as an Oracle Developer/Oracle Certified Trainer/Instructor object-oriented software design, Technical Writing, analysis, development & implementation of enterprise application system including databases namely Oracle & Access. Experience in Oracle Financials modules like AP and AR. Experience with Oracle Applications Incentive Compensation module. Experience in Technology Infrastructure Services. 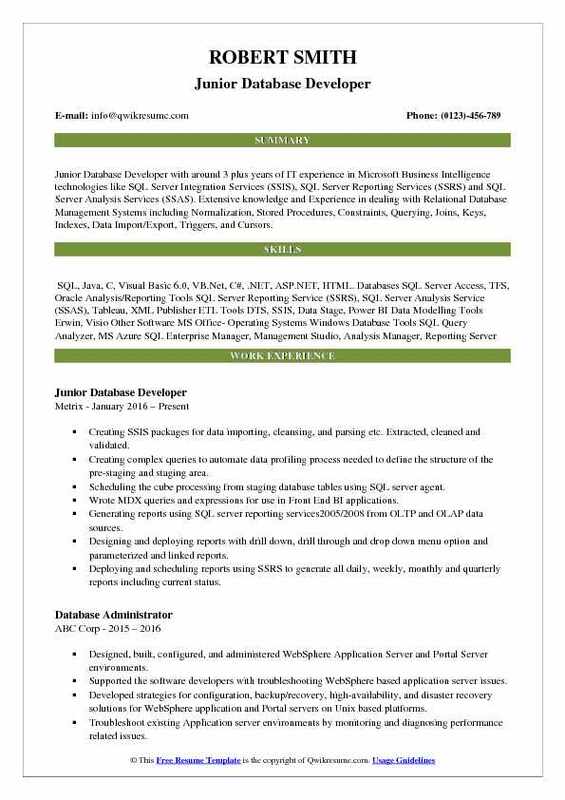 Skills : RDBMS Tools: Oracle , SQL Plus, MS Access, PL/SQL, Oracle Financials, Oracle Incentive Compensation, Designer 2000, Developer Forms Reports SQL Loader, VISIO 2003, SQL NAVIGATOR 3.2d11, TOAD 6.5.0.0., SQLDeveloper Internet Tool: HTML, ADOBE ACROBAT Java : Java Applets, HTML, Java Script, CSS. Languages: C, Fortran 77, And COBOL. Other S/W: Dreamweaver MX 2004, FRONTPAGE 2000, MS Office, MS Project. O.S: Windows Windows NT 4.0, MS-DOS, UNIX SYSTEM (Red Hat Linux 6.0 And Sun Solaris And KSH 1.17). Currently working as an Oracle database developer/certified Oracle instructor/trainer for Netcliff. Teaching Oracle SQL 11g/10g, Oracle PL/SQL 11g, Oracle forms 11g/10g and Oracle reports 11g/10g. Providing the training for Oracle certifications and for jobs in Oracle for the students to work as Oracle developers. Actively involved in maintaining the students' management system with the admission process, payment plans and strategies of students for the various courses. Working as a developer to automate and process the students registration process and payment plans. Working as a technical writer for producing process flow diagrams and ER diagrams for the full SDLC. Developing the students' management system to create and maintain students database. Creating tables to store information on students, courses they are taking and payments. Creating procedures so that when student ID is entered all his/her details are displayed. Creating functions to return the payment amount the students paid or are going to pay. Creating and maintaining the database of customers or clients, accounts payables, accounts. Keeping a track of accounts payables and receivables for clients depending on the no of. 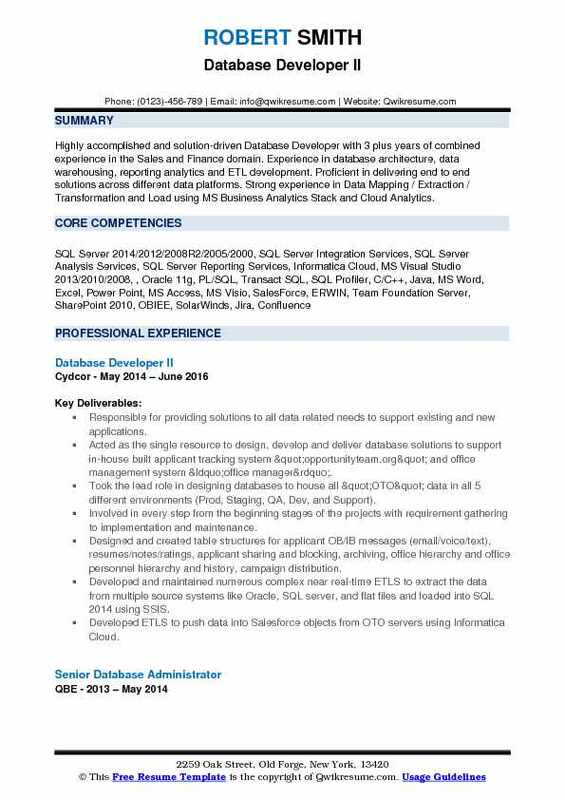 Summary : Database Developer with 9+ years in the Finance domain, experience in complete software development lifecycle with active engagement in database design, enterprise data warehouse, development of OLTP and OLAP, ETL processing, modeling, reporting and administrative tasks. Experienced in design and development of Packages, Cursors, Stored Procedures and Database Triggers using PL/SQL and a good understanding of Oracle data dictionary. Rapidly responding by adopting new technologies through leveraging cloud architectures. Architecting new applications and re-architecting the selected applications to the cloud-native or cloud-enabled. Developing applications using NoSQL data manipulation technologies - especially MongoDB. Working with ad-hoc queries, indexing, and real-time data aggregation with MongoDB. Working with MongoDB different challenges like data migration from, Oracle to MongoDB query migration, MongoDB query construction for new business requirements. Responsible for creating and modifying the PL/SQL procedures, functions & packages according to the business requirement. Creating the database objects like stored procedures, function, packages, cursor, ref cursor and triggers. Writing and modifying Oracle SQL statements and PL/SQL procedures and functions that are called in the Java methods to implement microservices. 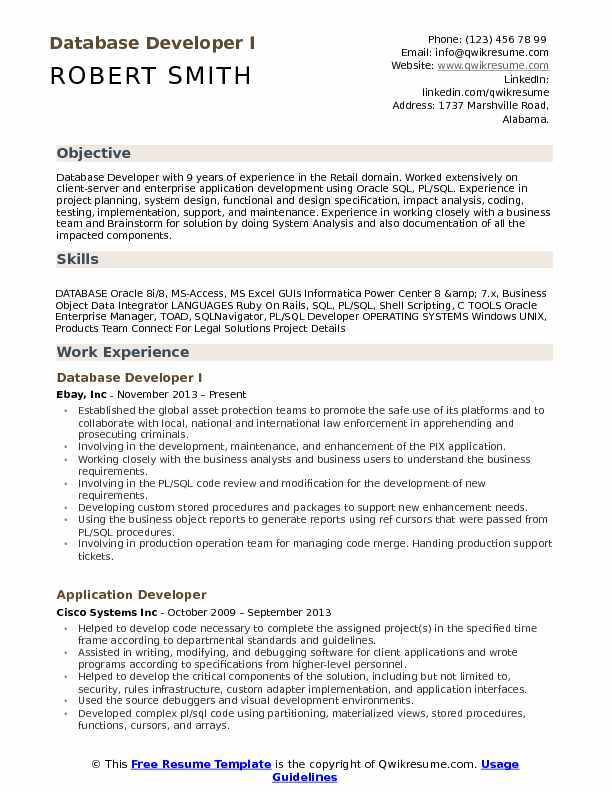 Summary : Database developer with over 14 years of experience in the Technology domain. 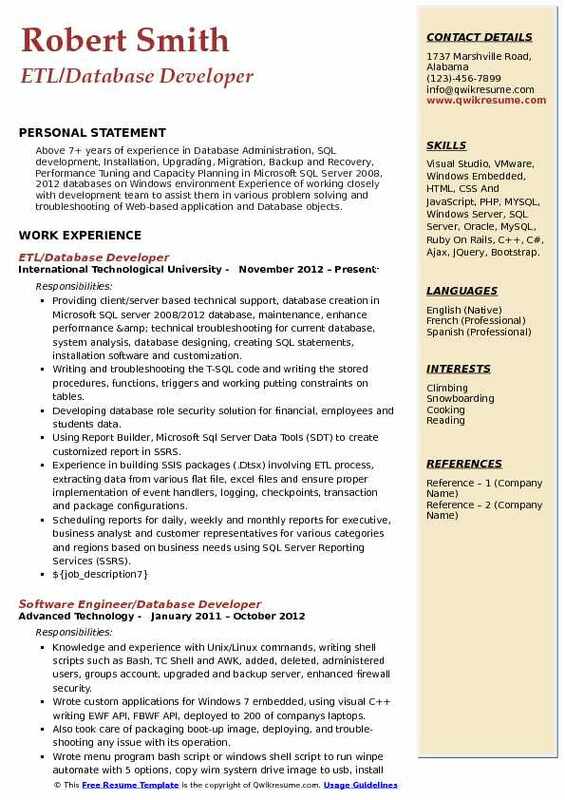 Currently seeking a database developer position that will utilize, and further develop my skills and abilities. Assisting more than 70 clients in planning, designing, implementing, and modifying the database. Became the programmer of choice for projects that required complex programming. Spearheaded the first implementation with quest diagnostics for orders and results. Designing and implementing the custom function for parsing result messages from Panther. Designing and implementing a module for AP easy that added the functionality of entering a dynamic library of questions with multiple choice answers. Assisting in creating, reviewing, and updating hl7 implementation specifications for both inbound and outbound interface messages. Designing and implementing a module for AP easy lis for clinical orders and results. Assisted in designing hl7 specification for billing software and implemented the first interface between ap easy lis and easy billing pro. Developed a bar-coding system which allowed users to search for records and navigate. Created a custom function for calculating turnaround time while excluding specific. Created custom label module that allowed end-users to store custom slide label layouts. Created a custom function for parsing blocks of text in to lines of text limited to a character length set by the end-user. Summary : Highly-motivated SQL Database Developer II with fifteen years experience in the development, design, and maintenance of MS SQL Server database platforms and front-end applications. Proficient in the creation and deployment of SSRS reports on financial, product and customer data. Experienced in writing and optimizing T-SQL stored procedures. Active in the Agile, Scrum frameworks and cross-team collaboration methodologies. Developing and maintaining various database systems and applications in development, test and production environments. Creating and deploying the SSRS reports on numerous data sources within the organization. Wrote T-SQL queries and stored procedures for various CRUD and ETL operations. Implemented BI360 data warehouse which allows for a single source of reporting on multi-company and multi-currency financial data within Minitab. Moved from SQL server 2008 r2 to SQL server 2014; modified custom code to ensure compatibility. Upgrading quality trainer, a subscription-based web product, from one version to another. Responsible for the data migration portion of the project, which included a mass update of hundreds of thousands of rows. Converted stored procedures for SSRS reports from using ONYX objects to Dynamics CRM objects (tables, views). Created and deployed SSRS reports for internal users that included product trial, launch and activation data. Implemented integration between SSRS and SharePoint 2007 for company-wide reporting. Converted crystal reports into SSRS reports using stored procedure data sources. Writing front-end web application with a SQL server database back-end, which stored data about all of Minitab’s products and releases. 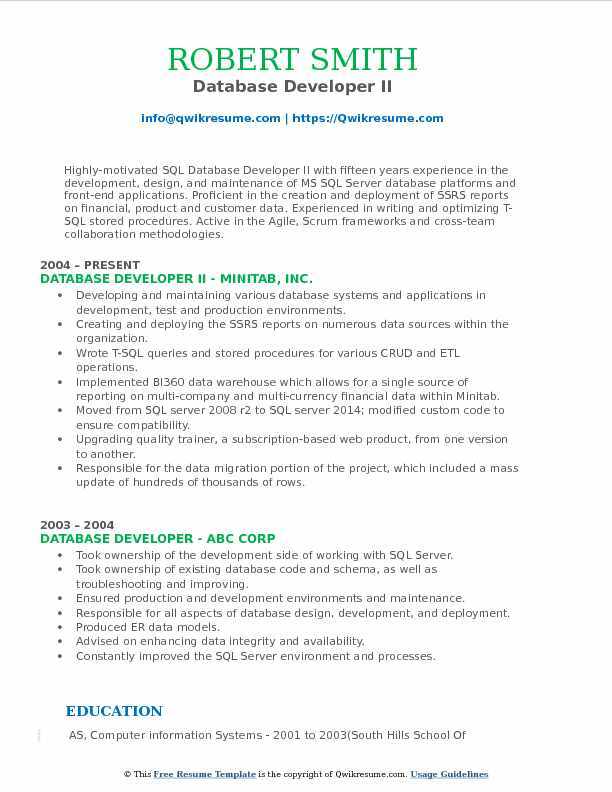 Objective : Database Developer with over 3 plus years of Database and BI developer experience in MS SQL Server (T-SQL), SSIS, SSRS with an emphasis on analyzing, designing, developing, installing, configuring, deploying and tuning. Highly motivated and a conceptually strong individual with exceptional analytical and design skills. Flexible, enthusiastic and project-oriented team player with good communication and leadership skills to develop a creative solution for challenging client needs. Experience working in agile environment, and attended daily scrum meetings. Creating several ETL packages using SSIS for loading data, creating member/claim files for counties, to work on several inbound and outbound jobs. Creating stored procedures, functions, and views in MySQL to support the SSIS packages, console applications, SSRS reporting, and data warehouse purposes. Improving the performance by creating indexes, splitting the query, reducing the number of rows/columns when not required etc. On-demand learned Powershell scripting and used it while developing console applications using C#. Creating reports using SSRS to make data speak visually using various types of graphs and charts. Working along with the DBA and deploying the SSIS packages on to the server both at package and project level. Working on creating the fee schedules, loading DTRR file, provider and member conversion, generating ID cards for members, and several other major tasks. Working together with Quality Analyst and Business Analyst to make sure all the business requirements are covered for the product. Summary : Above 7+ years of experience in Database Administration, SQL development, Installation, Upgrading, Migration, Backup and Recovery, Performance Tuning and Capacity Planning in Microsoft SQL Server 2008, 2012 databases on Windows environment Experience of working closely with development team to assist them in various problem solving and troubleshooting of Web-based application and Database objects. Providing client/server based technical support, database creation in Microsoft SQL server 2008/2012 database, maintenance, enhance performance & technical troubleshooting for current database, system analysis, database designing, creating SQL statements, installation software and customization. Writing and troubleshooting the T-SQL code and writing the stored procedures, functions, triggers and working putting constraints on tables. Developing database role security solution for financial, employees and students data. Using Report Builder, Microsoft Sql Server Data Tools (SDT) to create customized report in SSRS. Experience in building SSIS packages (.Dtsx) involving ETL process, extracting data from various flat file, excel files and ensure proper implementation of event handlers, logging, checkpoints, transaction and package configurations. Scheduling reports for daily, weekly and monthly reports for executive, business analyst and customer representatives for various categories and regions based on business needs using SQL Server Reporting Services (SSRS). 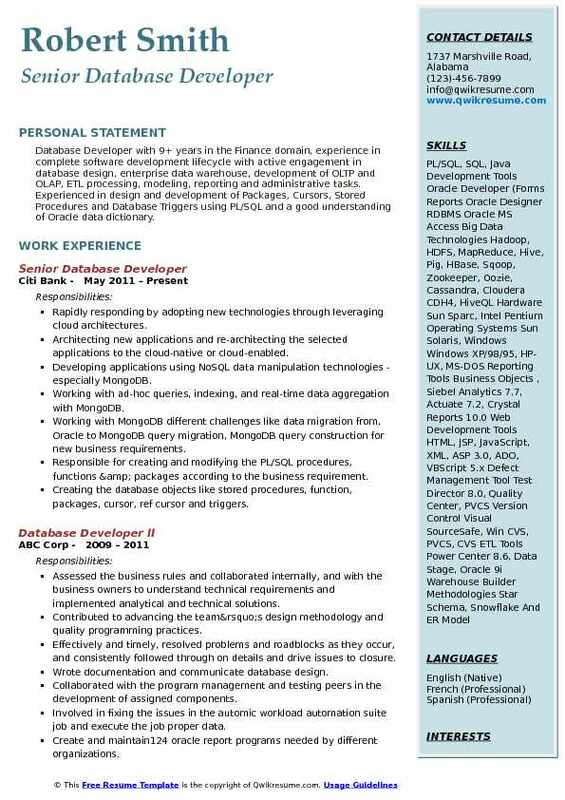 Headline : Database Developer with over 5 years of experience in troubleshooting, debugging, performance tuning, requirements gathering, implementation and production support, and translating client requirements into Production Database processes using Oracle 11g, 10g, 9i, SQL, PL/SQL, Dynamic SQL, SQL Plus. Excellent in Oral and Written communications. Supported the development from design through production release, utilizing Oracle database, Dynamic PL/SQL, SQL, Unix shell scripting, SQL loader. Code testing following TDD practices including maintenance/creation of unit tests and collaborating with functional and non-functional test team members to ensure quality output. Elaboration of functional requirements provided by the business including working with a cross-functional team of product owners, business analysts, project managers, QA testers and technical designers. Collaborating with technical specialists during creation of the functional requirements document. Data migration project: migration of modules such as: accounts, users, equotes, ibuy, and orders from atg to websphere commerce database. Creating the database objects such as: packages, procedures, functions, tables, views, external tables and unix scripts to migrate the data. Code testing: testing the requirements functionality and prepared unit testing according to requirements. Documentation: providing release notes to the production release team, and creating any additional guide to illustrate the whole functionality.